NEA Scout will perform a survey of an asteroid using a CubeSat and solar sail propulsion and gather a wide range of scientific data. NEA Scout will be launched on the first Space Launch System (SLS) launch. NASA asked Princeton Satellite Systems to develop custom MATLAB software based on the Princeton Satellite Systems Spacecraft Control Toolbox and Solar Sail Module to assist with this mission. We just delivered our first software release to NASA! 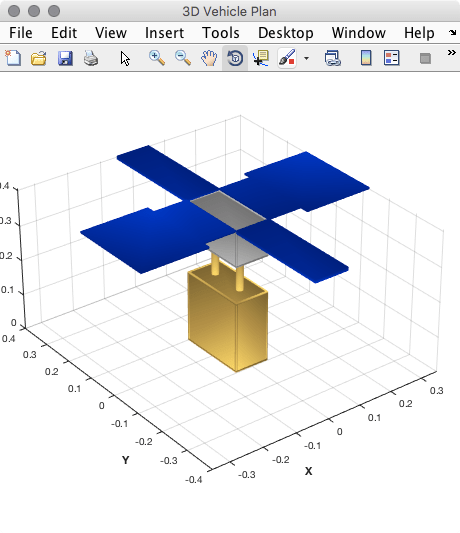 The NEA Scout module provides MATLAB scripts that simulate the spacecraft. One, TrajectorySimulation, simulates just the trajectory. It includes a solar sail force model and uses the JPL Ephemerides to compute the gravitational forces on the sail. In addition it can use a 150 x 150 Lunar Gravity model during lunar flybys. It also simulates the orbit dynamics of the target asteroid. AttitudeSimulation expands on this script. It adds attitude, power and thermal dynamics to the model. A full Attitude Control System (ACS) is included. This ACS uses reaction wheels and optionally cold gas thrusters for control. Momentum unloading can be done with the thrusters our using NASA’s Active Mass Translation (AMT) system that moves one part of the CubeSat relative to the other to adjust the center-of-mass so that it aligns with the system center-of-pressure or adds a slight offset to unload momentum. The control system reads command lists that allows the ACS to perform attitude maneuvers, do orbit changes with thrusters and for the user to change parameters during simulations. It adds the rotational dynamics of the asteroid. The dynamics of the AMT can be modeled either with a lag on the position or a full multi-body model. Dynamics of the reaction wheels, including a friction model, are included in the simulation. The following are a few figures from a typical simulation. 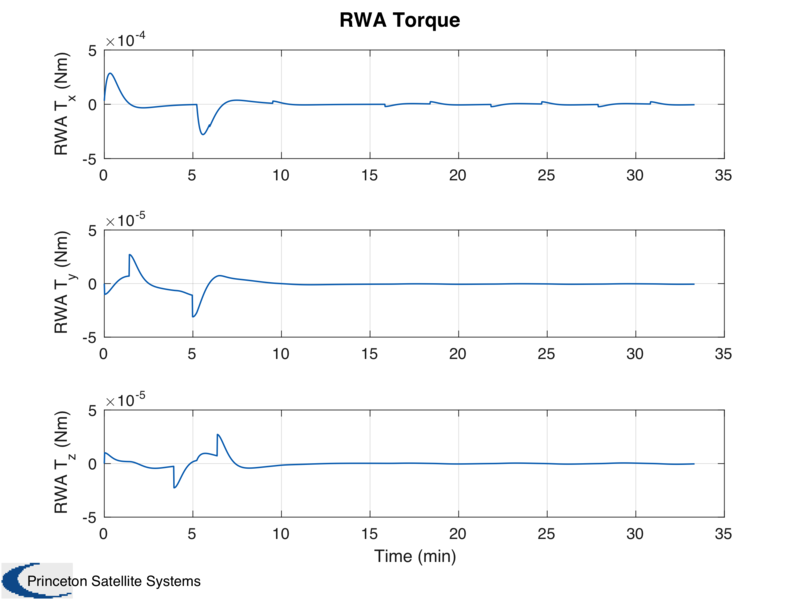 The first figure shows reaction wheel torques during attitude maneuvers. The ACS uses quaternions as its attitude reference. You can mix reaction wheels and thrusters or use either by themselves for attitude control. This GUI shows the current command and allows you to control the simulation. 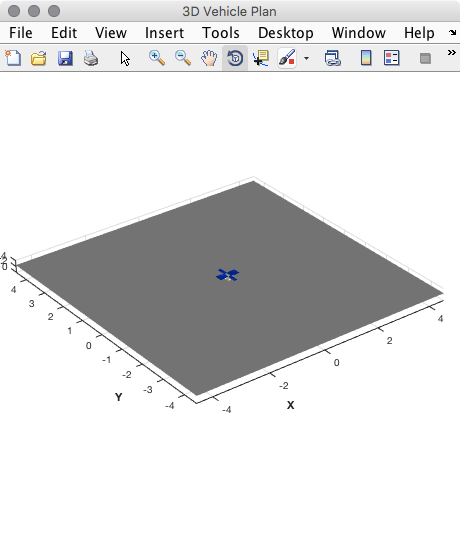 The Figure GUI lists all figures generated by the simulation. 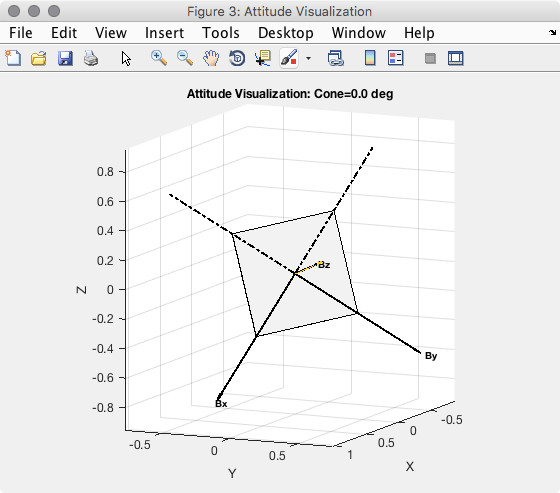 It makes it easy to find plots when you have many, as you do in the attitude simulation. 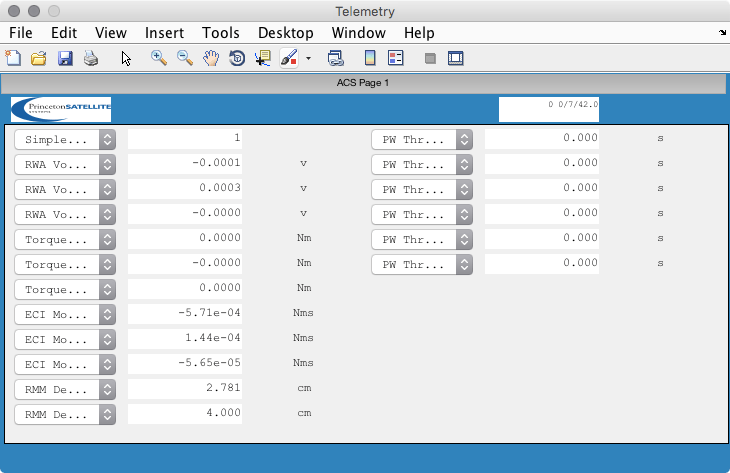 The Telemetry GUI gives you telemetry from the ACS system. You can easily add more data to the telemetry GUI which can have multiple pages. This figure shows solar sail pointing during simulations. The following figure shows the spacecraft with its solar sail deployed. This is built in the CAD script using the Spacecraft Control Toolbox CAD functions. The sail is 83 meters square. The sail is huge but the core spacecraft would sit comfortably on your desk. If you want more information about our products or our customization services you can email us directly by clicking Mission Simulation Tools. Yosef and Amanda are giving a seminar on our Spacecraft Control Toolbox in Sheffield, England on October 1, 2013. This event has been arranged through our UK distributors, MeadoTech Ltd. A big thank you goes out to Dr. Mohamed Mahmoud and Ruth Jenkinson! Check out what our MATLAB toolboxes have to offer!